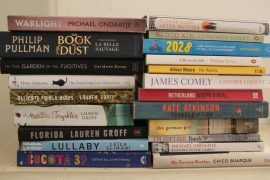 Death is a dominant theme for regional winners of the Commonwealth Short Story Prize just announced. Regional Winner, Africa: Let’s Tell This Story Properly by Jennifer Nansubuga Makumbi (Uganda). Nnameya is the grieving widow when she arrives at Entebbe Airport from Manchester with her husband Kayita’s coffin. But then events take such a dramatic turn that she must relinquish her widowhood and fight. Regional Winner, Canada & Europe: Killing Time, Lucy Caldwell (United Kingdom). A young girl just turned thirteen tries to take her own life. She swallows down as many paracetamol and baby aspirin tablets as she can and goes downstairs to have dinner with her family. That evening, and in the days that follow, she waits for something to happen, caught between the equally terrifying possibilities that something might, and that nothing will at all. Regional Winner, Pacific: The Dog and the Sea, Lucy Treloar (Australia). An old man who lives by the sea is kept company by his dog, the fragmentary stories contained in his troubled past, and a small boy who visits each summer. Regional Winner, Asia: A Day in the Death, Sara Adam Ang (Singapore). A story about someone trying to tell a story. It includes a distressingly un-dramatic suicide, facts and knowledge about Singapore in the early 20th century and the workers who built the city. Regional Winner Caribbean: Sending for Chantal, Maggie Harris (Guyana). The leaving of children with relatives whilst parents go abroad to seek employment is a familiar story, borne by promises of eventually being ‘sent for’. But what happens when a child never gets sent for? The central question remains, how do we measure achievement, and at what cost is economic migration to displaced and ‘broken’ families?